Kionix's IoT evaluation kit utilizes hardware platform based on Nordic Semiconductor's Bluetooth LE SoC. The compact (27/32mm x 4.2mm), highly integrated modular sensor system integrates Kionix's accelerometer (KX122-1037), combo accel-mag (KMX62), and combo accel-gyro (KXG03) sensors along with ROHM's barometric pressure sensor (BM1383AGLV). This enables measurement of 3D acceleration, 3D magnetism, 3D rotation, air pressure, and temperature, making it ideal for training, prototyping, and initial set development of IoT and wearable applications. 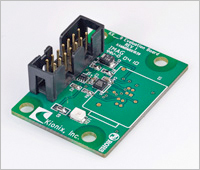 In addition, Kionix IoT Evaluation Kit supports over-the-air firmware upload via Bluetooth LE. The boards work out-of-the-box with Android applications, and application programming is easy with Nordic's development tools. Kionix's Evaluation Kit Software includes both Kionix Windows Sensor Evaluation and Multi-OS Evaluation Software. The Windows-based software is GUI driven to allow easy sensor configuration and data acquisition while the Multi-OS software is command-line driven for more flexible and sophisticated evaluation and algorithm development. This application allows the user to monitor data coming from the attached sensor. This data can be saved to a file or viewed in real time. With only two verification steps, the application will display a series of graphs representing acceleration with respect to time for each axis. This application allows the user to test and calculate the zero-g offset and sensitivity parameters of the accelerometer. Once the accelerometer is properly placed relative to the Earth's gravity, simple mouse clicks initiate a series of test sequences that result in the display of raw-count data. This application allows the user to read and write to specific registers of the accelerometer. The registers and their values are all displayed simultaneously on one color-coded grid. This utility allows the user to test whether the accelerometer has detected motion on any of the axes. Options are available to change the resolution (8-bit or 12-bit), output data rate, high-pass filter settings, WUF_THRESH and WUF_TIMER register values, or mask any of the axes. This utility allows the user to monitor the orientation of the accelerometer. It can be used to determine whether the accelerometer is in the face-up, face-down, left, right, up or down orientations. Options are available to change the resolution (8-bit or 12-bit), output data rate, TILT_TIMER, TILT_ANGLE, or HYST_SET (hysteresis) register values, or mask any of the axes. 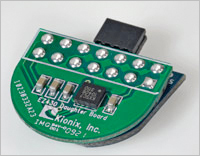 This Kit is composed of a Kionix Evaluation Board on which is soldered a customer-specified 3.3V Kionix accelerometer product, a Silicon Labs C8051F340DK that provides the microprocessor control and USB interface, and a Kionix F340 Adapter Board that provides the link between the Kionix Evaluation Board and the microprocessor. The USBDEVKIT without the Silicon Labs C8051F340DK microprocessor. The interface board that allows the connection of a Kionix evaluation board to a Silicon Labs C8051F340DK microcontroller development board.